My last forecast for tonight’s upcoming winter storm narrows down the areas that could see wintry precipitation and who might be left out this time. Radar at 8:00 PM EST. The models have been trending more northwestward with the surface low track and that has created a different look to the forecast than what first appeared earlier this week. With a track closer to the coast warm air aloft will spread further inland and will arrive faster as a result. This warm air aloft will bring sleet and freezing rain into the picture for many areas as opposed to the snow originally forecast and cut down on the forecast snow totals for the northern sections of ENC. This still is a delicate situation and small alterations to forecast track could have a huge impact on the forecast. Precipitation has already begun for southern sections as numerous reports of sleet from Jacksonville, Havlock, and Morehead City. Rain and snow have also been reported near Fayetteville. The radar shows echos spread out over the area but for areas to the north precipitation isn’t quite making it to the ground yet. This will change as the atmosphere becomes more moist. 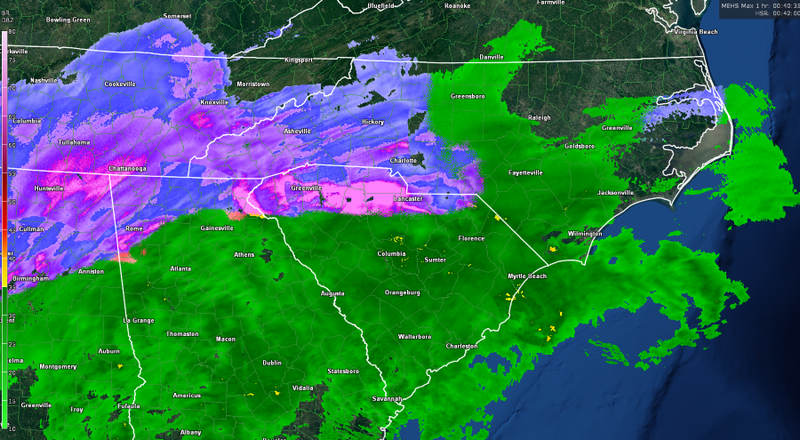 I expect precipitation to start out as rain/sleet and transition to snow shortly there after. At this time a heavy band of precipitation will fall along a line from Raleigh to the northeastern sections of ENC including the cities of Rocky Mount and Ahoskie. Snow rates during this time could exceed 2″ per hour. 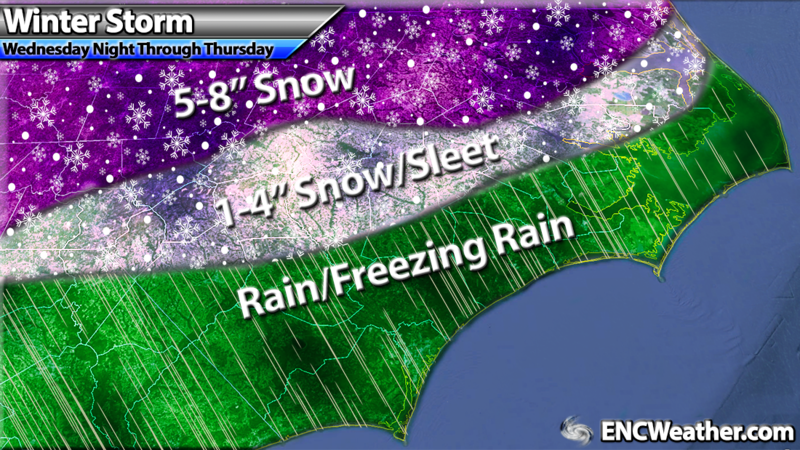 Giving the duration of snowfall, totals could exceed 5″ with some areas potentially approaching 10″. As the night progresses, snow will begin to change to sleet and freezing rain from south to north as the warm air aloft builds over the area. Final forecast for tonight’s winter storm. 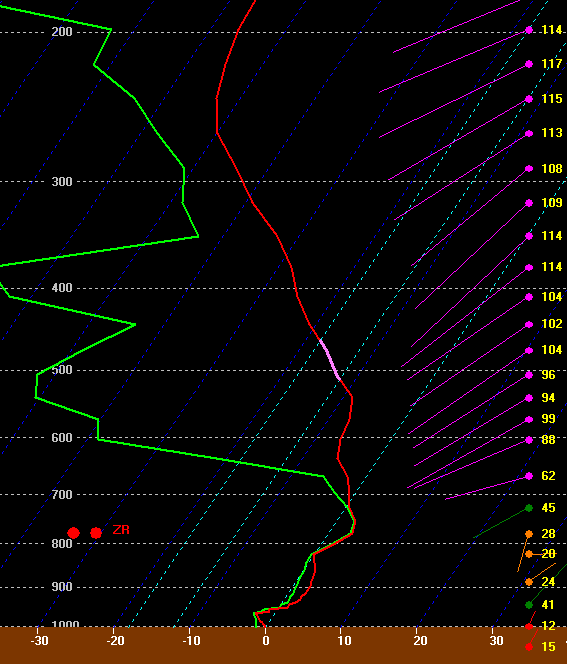 The warm air aloft will change snow over Greenville to sleet and freezing rain towards the end of the event. The atmosphere dries out during early morning with precipitation ending from southwest to northeast. I will be updating throughout the night.